That is, until I met Dan and Joanne. From our first meeting at their consultation, it was easy to see that this couple was something special. 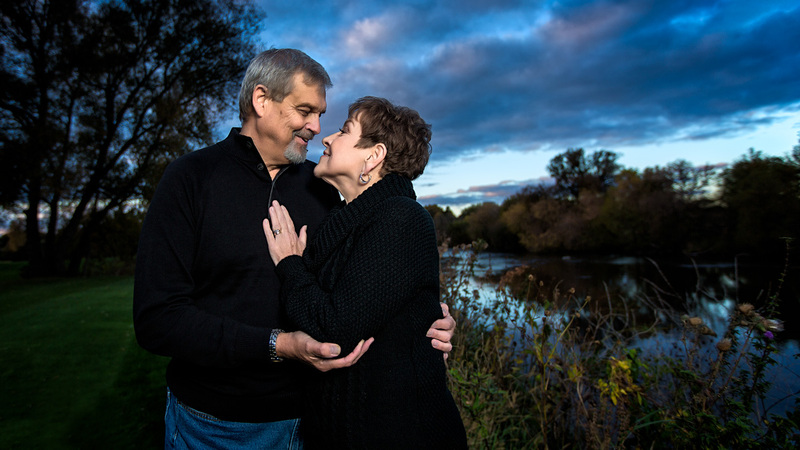 Joanne, 63, and Dan, 62, are happily married, happily retired, happily … well, just plain happy. Happy and nice, easy-going in a naturally calming way. We had ourselves some coffee and a few laughs while we talked about their upcoming portrait session (their first professional portraits) set to take place at the Dorchester Golf Club. Then, Joanne dropped something of a bombshell: only last year she was given just two months to live. It all started in March of 2014 when doctors found a spot on her lung. That was followed by a battery of tests – a lung biopsy, brain scan, a PET scan – a thorough battery of tests, to be sure. However, on May 2, Joanne was admitted to hospital for pneumonia. Only two days later, her doctor brought her the kind of news that nobody, ever, wants to hear … a terminal diagnosis. She was advised to get her affairs in order as she had two months remaining to her without treatment, possibly eight months with treatment. That was when she stopped breathing. Hospital staff rushed in and provided artificial respiration with a ventilator bag, which kept air circulating through her system. That was followed by a very necessary cardiac surgery during which the doctors installed a pericardial window to drain the fluid that had been building up in her heart (because of Joanne’s story, I did some personal research into the use for and technical how-to’s of pericardial windows – a somewhat distressing procedure, to say the least – as “… complication of pericardial window procedures may carry a high mortality rate” stuck out rather ominously). Now, you might be thinking “how could things get any worse?” I know I was. But, as life is so fond of tossing in an extra challenge when things are particularly trying, the doctors had to put Joanne into an induced a coma for three days. As much as Joanne’s story was harrowing for her, this was the point I stopped to think of Dan. From my own perspective, I know if something like this ever happened to my Amanda, I’d be little more than a man-shaped bag of jelly amped up on enough coffee to fuel a major league football team through to the new year. He must have been worried sick and I give him all the credit in the world for staying strong for his wife. Thankfully, that was the worst of it. Joanne, with her undeniably inspiring survivor spirit, was on the mend from her surgery and started chemotherapy by May 13. She had four initial treatments, once every four weeks. During this time, Joanne’s friends and family (they have four children) was, as she put it “beyond incredible”. In August of 2014, just six months from the first observation of “the spot”, she went in for a CAT scan to once again check on the progress of her cancer. The cancer that was now in remission! Of all the possible outcomes, Joanne and Dan must have been absolutely elated with the news. While she has to undergo monthly “maintenance chemo” for the rest of her life, “life” is hers again. When I asked Joanne how she felt about that, she happily responded with “It saves my life and I’m thankful for it. It lets me do what I want to do in my life”. Considering they are both in their own golf leagues, enjoy boating and fishing in the summer, and tripping down to Florida in the winter, I’d say she’s very much getting to do just that. They both are. So, here’s to a couple that I feel privileged having photographed. 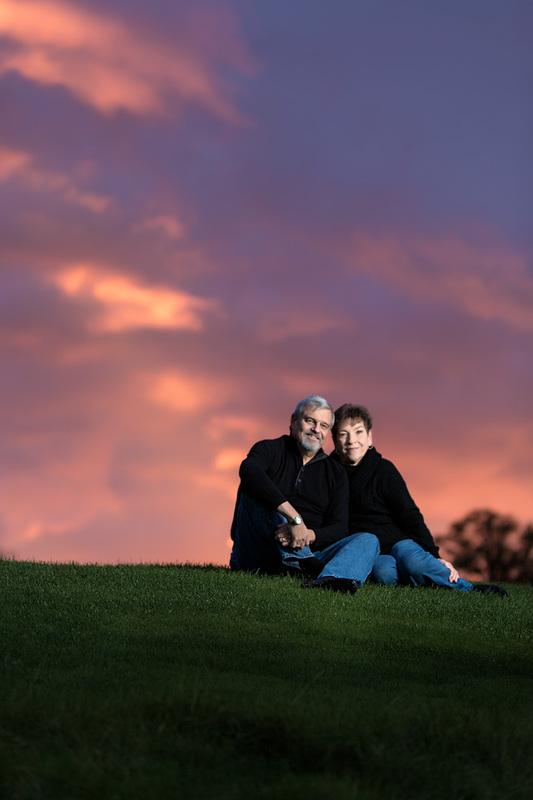 A couple with a fantastic story of dealing with adversity the only way true survivors can: together, with gratitude. Her attitude today is just as fantastic. As she told me, “stay positive and never give up”. Dan and Joanne, it was my honour to meet you. Long life and best wishes to you both. 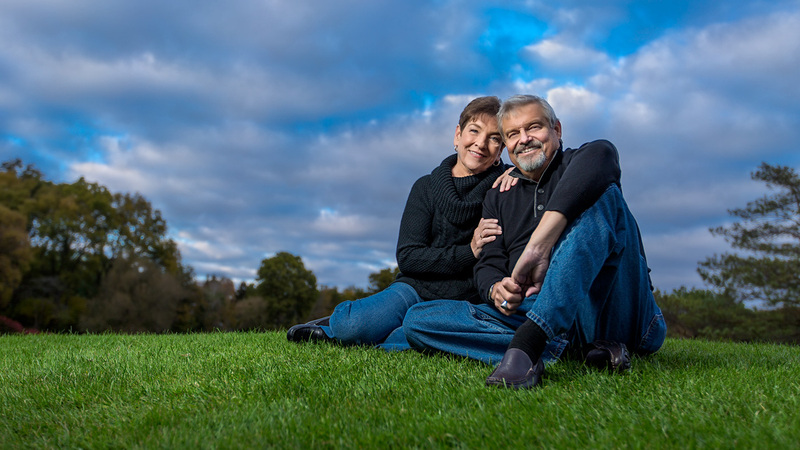 This entry was posted in Featured People and tagged Family, Heart, London, ON, cancer, couple's portraits, gold, life, lifestyle, living, photos, remission, second chance, story, survival, survivor. Great article Jay, and an even better image that is beautifully lit and composed.